I went to a show at Howlers on November 14th to see a plant play musick. Oh, the synth player from Carsickness, Steve Sciulli, was accompanying the plant rock star. There were some other people playing too. One guy was even a cyborg or something. 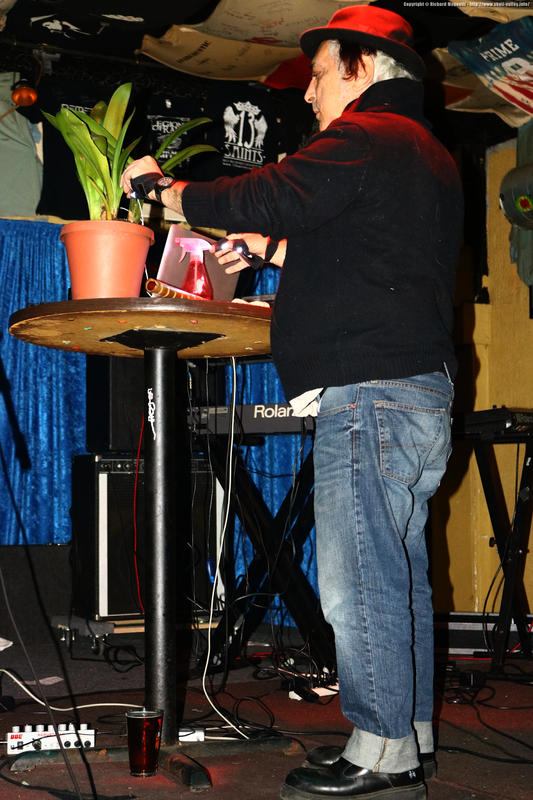 Steve and the plant played first. The plant made many different types of sounds: echoing Electroplankton hollow bells, Ocarina of Time well whispers, sweeping synths of sonic air, and strange rumbles from space. Steve brought these sounds out from the innards of his photosynthetic pal with different methods: fire, water, touch, sound, and light. 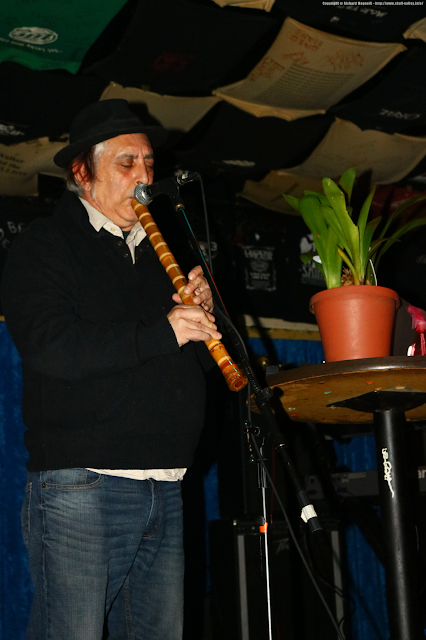 He even accompanied it on some kind of woodwind instrument. As the set was going on, I figured the whole thing must have been some kind of put on, but Steve confirmed that it was not. It was one of the coolest sets I've ever seen. Immediately after "Robert Plant", as the flora was called, finished, Ephen Ager started their set. I was a little put off by the sudden shift; Steve and "Robert" hadn't even got off the stage yet. I wasn't sure that anything was really starting until it had been going for a while without stopping. Anyway, Ephen's set was pretty good. 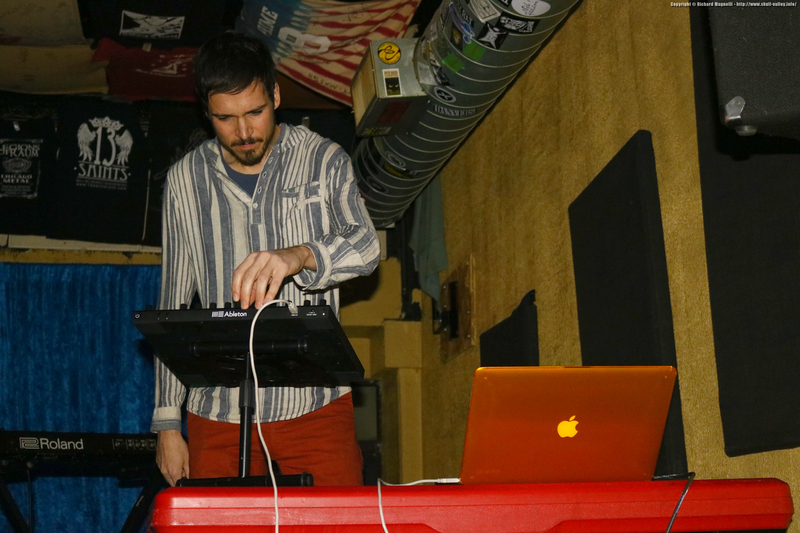 They played a lot of different stuff, ranging from fast techno beats to slower psychedelic tunes and harder jungle rumbles. A lot of it reminded me of the video game Wipeout. I enjoyed the musick, but, as with most electronic artists, I wish there had been more of a visual component to it. I like seeing people play instruments, seeing how the musick is created. Obviously you can't do that with a laptop, but there are other solutions. It would have been cool if everybody danced, but nobody did (that includes me too). The final performer for the night was Benni, a New Orleans-based musician on Goner Records that I had never heard of before. Before he played, he set up a video of dogs that projected onto the stage. I think it was an old PSA or instructional video. Benni's musick was awesome! It was cheesy, but that was all incorporated into the retro sci-fi aesthetic. 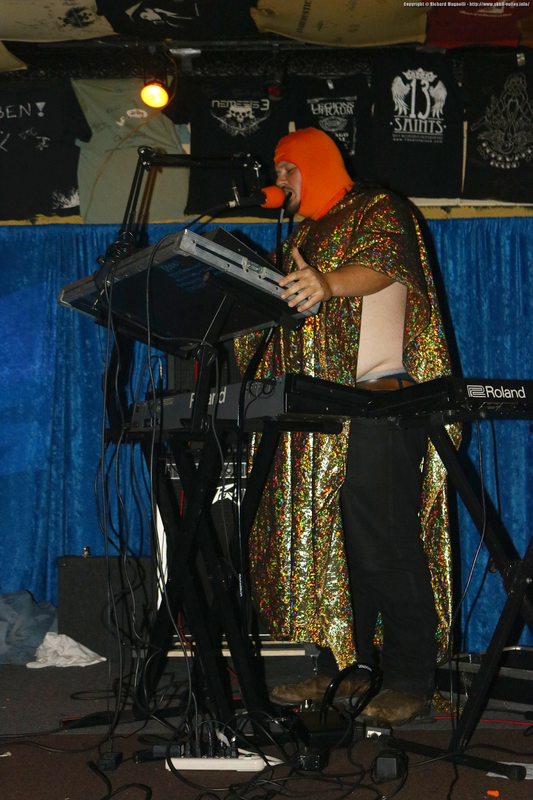 He had a metallic cape on and used a vocoder for everything. He combined elements of Vangelis, Tangerine Dream, and John Carpenter to great effect. I loved the song about being more than a man with awesome musical hook and lyrics. "My power knows no bounds!" "I am supreme machine!" So cool! After Benni's set, I bought a record and talked with him for a bit, talked to Steve, and then walked home. I haven't listened to the Benni record yet, but I will review it once I get the time to visit the "Moons of Almuric". Most importantly, I hope to see more plants making musick in the future. I Get the inspiration to go ahead. Just wanted to mention keep up the great job!